An array of interior and exterior embellishments. For future customers and owners grumbling about their 2015 BMW M4 or M3 not looking sporty enough or lacking the dynamic stance, BMW's M Division has presented a solution. The company has unveiled a series of M Performance accessories and parts that add more character to the performance oriented mid-size cars. The exterior sports several carbon fiber and PUR parts. Customer who specify the M Performance package can expect add-on components made from carbon fiber such as the front air intakes, a polyurethene (PUR) front spoiler that is subtle, deeper side skirts made from PUR, and at the back, a carbon fiber rear spoiler and rear diffuser complete the exterior accessories. The characteristic M tri-color stripe is painted across the body, and the side skirts will feature "M Performance" lettering. Inside, the car will come with the newly launched M Performance steering wheels that is wrapped in Alcantara and trimmed in carbon fiber. It features a race monitor that displays the current gear and acceleration figures. In Sports mode, it functions as a stop watch to record your lap times, and in Race mode, it displays the lap times. The engineers have also improved the exhaust note by updating the silencers so that the sound channeled through the speakers generates a louder note that “underlines the performance characteristics” of the biturbo straight-six engine. The steering is wrapped in Alcantara and trimmed in carbon fiber. 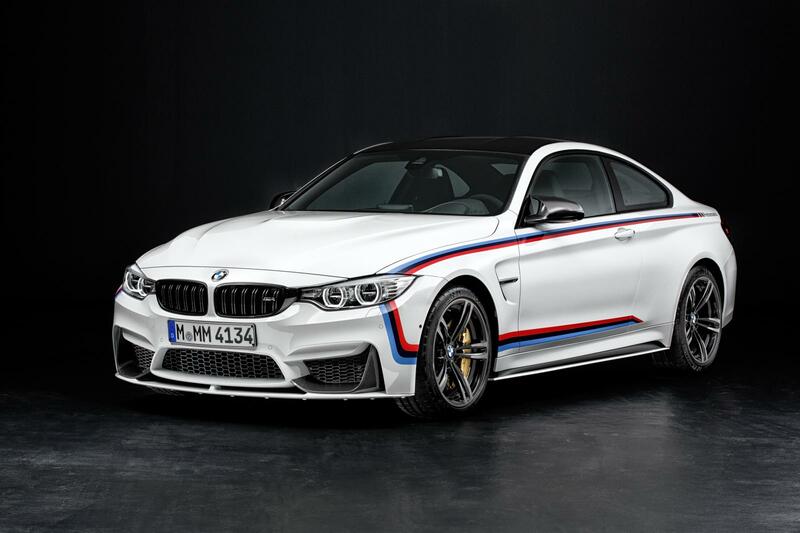 The M Performance pack is only available as an optional extra for the 2015 M3 Saloon, M4 Coupe and M4 Convertible. More details are available in the press release below the gallery. The 2015 BMW M3 and M4 will be launched in India on November 26.